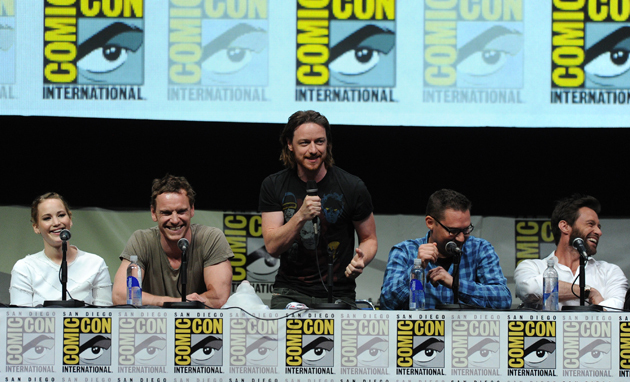 Comic-Con International: San Diego was in a frenzy after the surprise X-Men: Days of Future Past cast unveiling. Check out the Comic-Con panel video below. Hugh Jackman, James McAvoy, Michael Fassbender, Jennifer Lawrence, Nicholas Hoult, Patrick Stewart, Ian McKellen, Halle Berry, Anna Paquin, Ellen Page, Shawn Ashmore, Evan Peters and Peter Dinklage star in the comic book adaptation in 2D and 3D theaters May 23, 2014. The cast of director Bryan Singer’s original X-Men Trilogy and 2011’s X-Men First Class come together for the first time on the big screen. Based on the classic Marvel Comics “The Uncanny X-Men: Days of Future Past” storyline, Logan/Wolverine finds himself trapped in an alternate timeline where the existence of all mutants are threatened by Sentinels created by Trask Industries.